Dual cameras on smartphones started off as more of a gimmick before becoming a feature on most high end and a couple of mid-range smartphones. Now smartphone manufacturers are now pushing beyond the dual rear camera setup. Huawei started the triple rear camera trend on the Huawei P20 pro and now LG has just adopted something similar on it's LG V40 ThinQ. The LG V40 ThinQ comes with a 6.4-inch P-OLED display with a resolution of 1440 x 3120 pixels with 537 ppi pixel density and a 19.5:9 aspect ration. The 6.4 -inch display on this device is the largest on an LG V series smartphone. The device is powered by Qualcomm's Snapdragon 845 chipset coupled with a 6GB RAM and a 64GB of internal storage which can be expanded via the SDcard slot. It runs on last year's Android 8.1 Oreo out of the box with LG's custom launcher on top. An Android 9 Pie update will eventually roll out in the nearest future, but unfortunately we don't have a date yet. The main selling point of the LG V40 ThinQ is it's 5 total cameras. It comes with a triple rear camera setup with the main camera having a 12MP sensor with Optical Image Stabilization (OIS), F1.5 aperture lens for better low light shots and a 1.4-micron pixels. One of the two other cameras has a 16MP ultra wide-angle module for up to 107-degree wide-angle shot, while the other is a 12MP 2X zoom telephoto camera with F2.4 lens. The notch at the top of the LG V40 houses the earpiece as well as a dual front facing selfie camera with a primary 8MP sensor with F1.9 and a secondary 5MP wide-angle lens with F2.4. The LG V40 can shoot 4K video at up to 60 frames per second and it can also take Slo Mo shots of 1080p at 240 frames per second. The battery on the V40 is however on the lower side at just 3,300mAh and it supports Qualcomm Quick Charge 3.0. The device also has an IP68 rating for water and dust resistance. 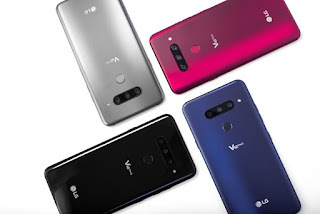 You will be able to get the LG V40 ThinQ in Aurora Black (polished finish) and Moroccan Blue (sandblasted) from October 18 at the starting price of $900.